Ten days after the reality of "rampant manipulation" in VIX was exposed yet again, perhaps because this time the market went down, US regulators are reportedly escalating their investigations into whether any wrongdoing occurred within VIX ETPs. Following previous reports that The Financial Industry Regulatory Authority (FINRA) was scrutinizing whether traders placed bets on S&P 500 options in order to influence prices for VIX futures, and a whistleblower's detailed explanation of how easy it is to spoof VIX's tail to wag the market's dog; Bloomberg reports that The Securities and Exchange Commission and the Commodity Futures Trading Commission have been conducting a broad review of trading since Feb. 5, when volatility spiked and investors lost billions of dollars, several people familiar with the matter said. And, Bloomberg notes that after the losses, SEC officials reached out to Credit Suisse, a person with direct knowledge of the conversations said. Neither Credit Suisse nor ProShares have been accused of any wrongdoing. The regulators’ examinations are at an early stage and won’t necessarily lead to sanctions or new rules. 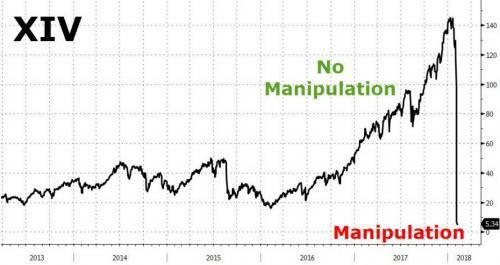 As another reminder, in May of last year we academic confirmation of the rigged nature the US equity market's volatility complex, when a scientific study found "systemic VIX auction settlement manipulation." 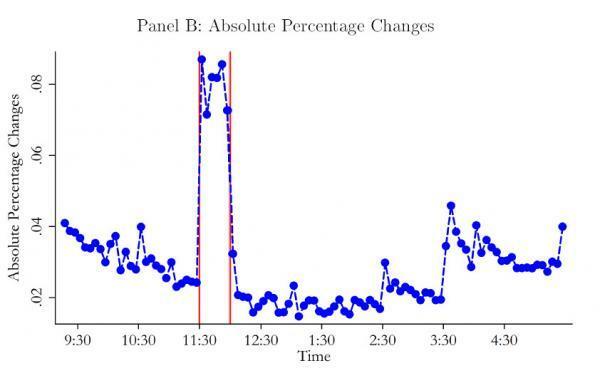 Two University of Texas at Austin finance professors found "large transient deviations in VIX prices" around the morning auction, "consistent with market manipulation." ​Griffin and Shams calculate that "the size of VIX futures with open interest at settlement is on average 5.7 times the size SPX options traded at settlement, and it is 7.3 times for VIX options that are in-the-money at settlement." Bloomberg concludes that there is no indication thus far that specific companies, including Credit Suisse, are being probed, and an SEC spokesman declined to comment, while CFTC officials didn’t respond to requests for comment; but with losses now piling up, allegations of market manipulation are getting more attention and government watchdogs face questions about why small-time investors were permitted to buy such products in the first place. While we certainly won't be holding out breath for any regulatory crackdown on these products (as they are the mothers' milk of the stock market), it is at least a positive that there is finally some scrutiny on the volatility complex (that may, just may, prompt some retail investors to be at least a little less willing to pile all their investments into the short-vol trade once again).